We have finally completed show season. I am so very thankful that it is over. We only attended two shows with our animals this year. It is my goal to head in a different direction with our herd, so showing will be put on the back burner for a while. Ayana will be attending some shows, but not with our animals. She is due to leave Thursday evening for Nebraska with 98 animals in tow. Better her than me! 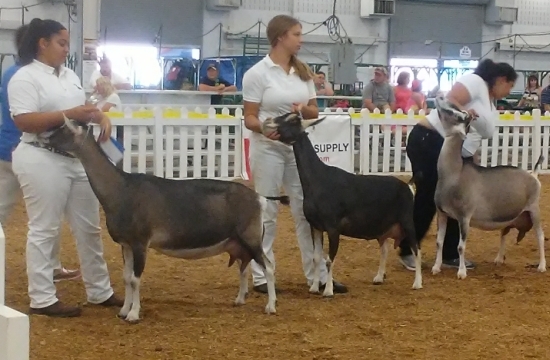 While we didn't do as well at the Indiana State Fair as we had hoped, goat shows aren't always about where you place. Goat people are like a huge family that gather at shows. We added a few to the family this year and we had the best time. 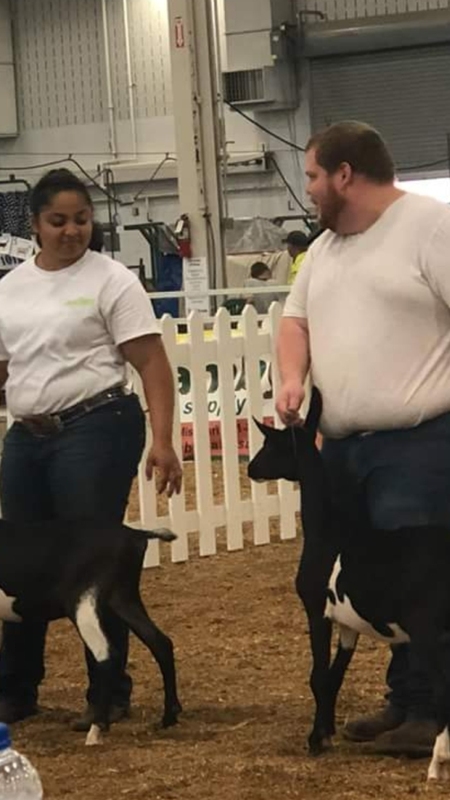 Sydnie and Anthony II showed up to help show and of course the rivalry between Anthony and Ayana of who could beat who in the show ring reared its funny head. Watching them battle it out as to who could show which doe better sometimes becomes comical. Sydnie is probably the best showman of the three, yet she just stands quietly and does her thing, making the animals she handles look good. Anthony, Ayana and Sydnie have all shown and traveled with Bruce and Klisse Foster, making my kids all Foster kids. I think that Bruce and Klisse might have been as excited as I was to have them all in the ring together. These folks have allowed my children to travel with them all over the United States giving them incredible opportunities and a lifetime of memories. I am so very grateful that my children have had these folks in their lives and as part of our goat family. With show season over we will now concentrate on breeding season. Oh how the aroma burns! There is nothing worse than the smell of a buck. We have 7 with 2 more coming in. I'm pretty sure there is a buck cloud over our house! One of the things that we will be doing this year in bring in a Nigerian buck to breed to our standard size does. He will only breed the first fresheners -- does that have never been bred before. This is my way of ensuring that I will not keep a bunch of babies next year. While Nigerians are a dairy goat, babies from them that are out of standard size animals that cannot be registered with the American Dairy Goat Association. We will have mini alpines and mini sables. The ones that have already kidded before will be bred to our standard size bucks. It will be an adventure to say the least! This year we were only going to keep kids out of one certain doe. She had one kid. We kept 12 total. We bought 2 at state fair. My numbers are not calculating right. My Nigerian buck will be my new calculator! I have had time to can salsa, and only salsa, so far this year. I plan to call Bush's today and see about getting some peppers so that I can make mustard. Anthony eats that stuff like I eat M&M's! The mustard I make for him will clean your sinuses! I usually have to leave the room while it is cooking. I may do some green beans and pumpkin this year. I love to can, but just don't have the time to do all I would like. I have several lap quilts to finish. Thanks to my friend, Kate Phillips, for putting the tops together for me. She did a beautiful job on them! Once I finish them they will be headed to the nursing home. I have several other quilts to do for Christmas. I assume the grandkids will want pajama pants again this year as well. My poor sewing machines will get a workout! I am so looking forward to fall. I believe it is my favorite season -- the colors, the smell (once you can no longer smell the bucks.) It just seems like a more relaxing time. I love to have my family together sitting around a fire. I love to walk in my little woods and feel the leaves crunch under my feet. I love to watch the farmers harvesting crops and the sound of the augers and grain bins bring back many childhood memories. I was so blessed to be brought up on the farm and to have been able to raise my children in the country. They have an appreciation for hard work and dedication. They understand life is a miracle and that death is part of life. While I have not led a perfect life, God has truly blessed me with an abundance of His beauty. Remember to look around and see all the beauty He has blessed you with!